United Way of Story County has been impacting the quality of life in Story County for more than six decades. Sixty years ago and now, United Way of Story County helps children prepare for adulthood, keeps seniors in healthy environments and offers a helping hand to hard-working families. It’s true that none of this would happen without strong community partners and dedicated donors. While there is much to be joyful for, we know we can’t stop now. The challenges facing our community are increasingly complex and require evidence-based solutions to provide real, long-lasting change. United Way of Story County is a strategic leader in building county-wide partnerships. The relationships we have with partner agencies, business community members and experts outside of the area means United Way of Story County is in a unique position to identify needs and to develop, support and evaluate effective human services. 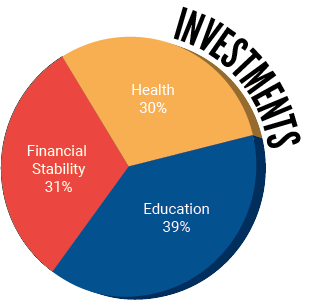 This calls for a focus in three key areas: health, education, and financial stability. Partner agencies receive important funding for program support through the ASSET process. Beyond that, United Way of Story County is now more adept at responding to the ever-changing landscape of needs through grant funding, leading conversations in high need areas and building collaborations to address community-wide problems. This includes bringing new solutions and pilot projects to our communities. By improving the health, education, and financial stability of Story County, United Way of Story County is creating a strong, more vibrant place for everyone to enjoy a high quality of life. We recognize no one person or organization can do it alone. In the spirit of collective action, we would like to invite you to join UWSC in our community building efforts to LIVE UNITED.